Drizzle is very calm and is a wonderful mommy. She has produced amazing puppies, solids and parti. Since she has such a motherly instinct, Drizzle and our daughter have a very special bond together. Health Tested: Cleared for:Cleared for:, CERF, OFA Hips, OFA Elbows, OFA Patella, DM, EIC, HNPK, NEWS, cord1, crd4, crd4/cord1, PRA-cord1, PRA-crd4, PRA-crd4/cord1, PRA-PRCD, PRCD, VWDI, IC, CMS, Elliptocytosis, GM2, HUU, OCD, GR-PRA2, GR2-PRA and PK Deficiency. Marshmellow has really nice deep red markings. The only thing is they are hard to see in photos since she is an extreme parti, meaning mostly white. The red markings are under her ears and little spots between her toes and on her back. Most people think she's just white, but she is a parti girl. We are so excited to see her puppies. Health Tested: Cleared for: Cleared for:, CERF, OFA Hips, OFA Elbows, OFA Patella, DM (WT/M), EIC, HNPK, NEWS, cord1, crd4, crd4/cord1, PRA-cord1, PRA-crd4, PRA-crd4/cord1, PRA-PRCD, PRCD, VWDI, IC, CMS, Elliptocytosis, GM2, HUU, OCD, GR-PRA2, GR2-PRA and PK Deficiency. 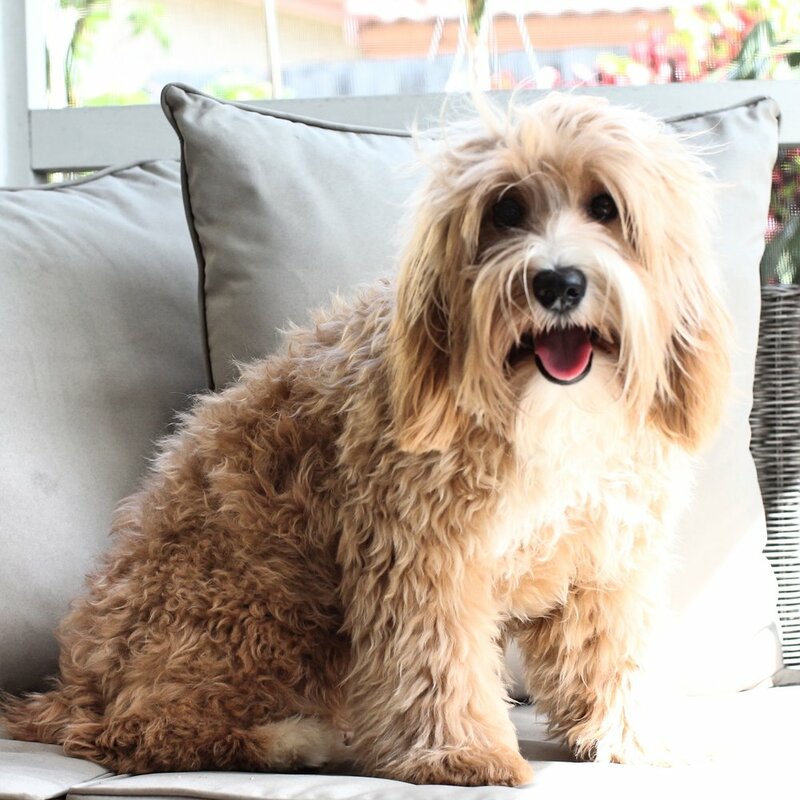 Peanut is the first dog that was produced here at South Florida Australian Labradoodles. She has the amazing apricot fleece coat from her father Muppet. She has a playful and sweet personality. We are excited to see what Peanut produces this year. Health Tested: Cleared for:Cleared for:, CERF, OFA Hips, OFA Elbows, OFA Patella, DM, EIC , HNPK(WT/M), NEWS, cord1, crd4, crd4/cord1, PRA-cord1, PRA-crd4, PRA-crd4/cord1, PRA-PRCD, PRCD, VWDI, IC, CMS, Elliptocytosis, GM2, HUU, OCD, GR-PRA2, GR2-PRA and PK Deficiency. Daliah has that beautiful red fleece coat. Her color is amazing and has a sweet face. She is laid back and quiet. She loves to sit on your lap for hours. We are excited to see Daliah's puppies in 2019. Health Tested: Cleared for: Cleared for:, CERF, OFA Hips, OFA Elbows, OFA Patella, DM, EIC, HNPK, NEWS, cord1, crd4, crd4/cord1, PRA-cord1, PRA-crd4, PRA-crd4/cord1, PRA-PRCD, PRCD, VWDI, IC, CMS, Elliptocytosis, GM2, HUU, OCD, GR-PRA2, GR2-PRA and PK Deficiency. Pretzel is the little queen. She is playful and outgoing. Her caramel parti fleece coat is gorgeous and has the personality to match. She also carries for phantom so we are super excited for her babies in 2019! Health Tested: Cleared for:, CERF, OFA Hips, OFA Elbows, OFA Patella, DM, EIC, HNPK, NEWS, cord1, crd4, crd4/cord1, PRA-cord1, PRA-crd4, PRA-crd4/cord1, PRA-PRCD, PRCD, VWDI, IC (carrier, not affected) CMS, Elliptocytosis, GM2, HUU, OCD, GR-PRA2, GR2-PRA and PK Deficiency. Look for this little beauty the end of 2019! She has such a sweet and loving personality. Can’t wait to watch her grow. Health Tested: Cleared for:, CERF, OFA Hips, OFA Elbows, OFA Patella, DM/M, EIC, HNPK, NEWS, cord1, crd4, crd4/cord1, PRA-cord1, PRA-crd4, PRA-crd4/cord1, PRA-PRCD, PRCD, VWDI, IC, CMS, Elliptocytosis, GM2, HUU, OCD, GR-PRA2, GR2-PRA and PK Deficiency. Jelly has a beautiful structure. She is going to be an amazing addition to SF Australian Labradoodles. Peanut couldn’t be any prouder. This is Drizzle’s first Granddaughter. Can’t wait to watch her grow.